Sciatica is a set of symptoms including pain and strange sensations in the low back, buttock and leg. Sciatica can be caused by compression or irritation of one of the spinal nerves in the low back. This may be due to a lumbar disc herniation or prolapse. Another cause is tightness in the piriformis muscle (a deep muscle in the buttock) - sometimes aggravated if you sit with a wallet or keys in your back pocket. Rarely, the cause of sciatica stems from a growth in the spinal canal, in which case you may need surgical intervention. In addition to pain, which is sometimes severe, there may be numbness, muscular weakness, "pins and needles" or tingling and difficulty in moving or putting weight through the leg. Typically, the symptoms are only felt on one side of the body. Treatment for sciatica will depend upon the underlying cause of the symptoms. Manipulation and stretching (traction) may help to resolve the problem, but it can take several weeks for all symptoms to subside. 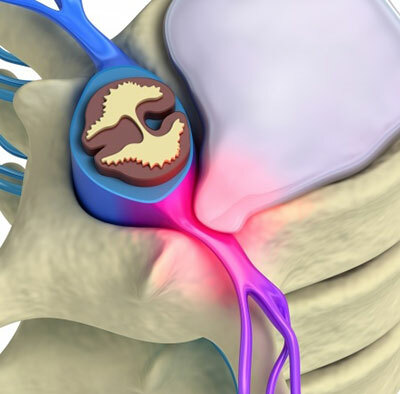 Some people with disc problems have recurring episodes of sciatica throughout their life. Osteopathy may help with the short-term symptoms, but you may need to strengthen the deep abdominal "core" muscles (to support the lumbar spine) - Pilates exercises (or similar) may be of benefit. WHAT IS A 'SLIPPED DISC'? The term 'slipped disc' doesn't give a realistic explanation of what has happened in your spine to cause pain and other symptoms. The disc between two bones in the spine contains two parts - a tough, fibrous outer ring, and a thick fluid material in the middle, which provides a cushion between the bones. Twisting injuries can cause the outer disc fibres to tear and cause pain over that area of the back and possibly also in a predictable pattern down the back to the leg. When the inner disc material pushes through the outer fibrous ring, due to degeneration of the disc, or through an injury (e.g. lifting a heavy load), this can either push on the nerves passing between the bones of the spine, or can just cause a chemical irritation which produces pain and other symptoms in the body along the path of the nerve. For example, at the base of the spine (the weakest point), the disc could push out and irritate the nerves at the base of the spine, causing a referred pain pattern into the leg and buttock on that side, with weakness in the leg.